Home ...of Interest When you have finished a project, what comes next? When you have finished a project, what comes next? What happens once you’ve finished your 365 images project? What comes next? It took me almost a whole year to finally finish my Leia project. 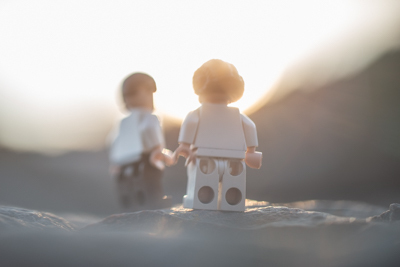 I spent 2017 doing photographic reflections with a toy (a minifigure of Leia) as a motive. 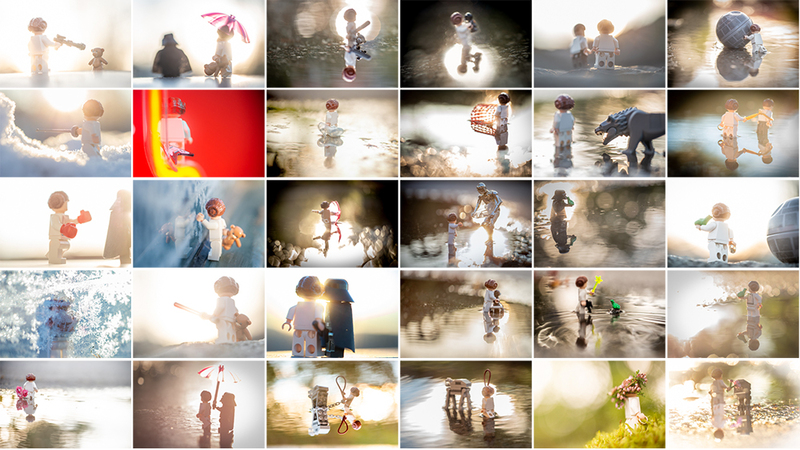 I also blogged about this project on the blog “ToyPhotographers.com”. Most of my images were posted on Instagram as well as on my blog www.kral.se during that year. All together it became a 365 project about a princess; “a space princess”. But what happens next? What do you do with all the images? What comes after a 365-project? What would be the project for 2018? Many 365-projects are finished once the photographer has done all the pictures. When they have published them, one each day during a whole year. But that wasn’t true for this project. I saw the 365-image project as a way to get a dump of images -a first selection for a project- that I could use to do a selection for a body of work. As many others who embark on a 365-project, I was totally finished with both my subject and my toys once the year was done. I was drained! But the idea to look through the images to try to see if there is a new body of work among these images drove me to go the next step – a new project in itself. I wanted to see if I could bring some stories forward so they would be more visible to myself and others. I decided to use my 365-project to do a selection around the concept of a princess. This project is more about looking at the pictures than making images. The focus is about making choices and finding themes that I could highlight. By looking and looking again – saying yes/no/maybe to each image – I could do a selection to highlight some of the “best” pictures. I did a first selection which was about Yes/No/Maybe. Three piles of photographs were created. I let two of those piles (Yes and Maybe) rest for weeks (or to be completely honest, months). Then I borrowed a dear friends eyes to look through my first selection of Yes and Maybe images. And after her selection I made a second attempt… With the help of another pair of eyes – I could move some Yes’s to No, and some Maybe’s to Yes or No. When I started the selection process I had about 400 images selected. This quickly became about 200 images after the first selection. Then I edited down to around 150 images, then to about 100 and finally I landed with 59 images about a space-princess. As I look through the pictures, I saw several threads. One thread is about the character that we recognize as Princess Leia, from a saga that we call Star Wars. 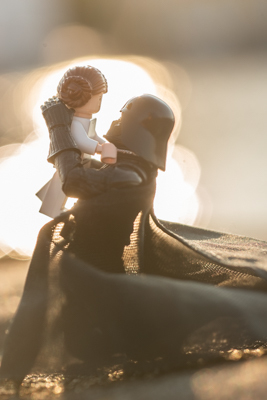 This story is close to the world where I first got to know the princess Leia. In these images I have portrayed some scenes from her ordinary life, her childhood, her training and so on. You may recognize the Princess who will lead the rebel’s army. At least I hope you will. Another story line that I see is the story about a princess, one that you will recognize from traditional fairy tales and myths. This princess you will know from fairy tales like Snow White, Cinderella and Little Red Riding Hood or myths like the ones about Eve, Aphrodite and so on. The third thread I saw is the story about me. This one isn’t about any princess. I see themes that come from my fears and my doubts. A story about the questions that I never dare to approach without having the camera and my photography as a method. By looking at the pictures, you may see a story about my secrets, my fears, my dreams and my doubts. Some of you may see a story about what it means to be human, a search for belonging, or a pursuit of adventure, or a longing for love, to find someone who understands one. And in the best pictures all these threads intertwine. As you look through the pictures, you may think that many are the same (or almost the same. Many are in water piles, everyone seems to have a tone of melancholy, loneliness and have a present or absent princess. In many, if not all of the images, the figure is faceless. This is a choice I have made, because when you can’t see the figures faces, you cant tell if they’re happy, scared, afraid, hopeful or excited. You have to look inside and feel. Another red thread running through these images is the use of attributes from the land of the fairy tale. You will find them in the form of a prince, a frog, an apple, an arc or a sword. But there are also attributes I borrowed from Star Wars such as the figure of Darth Vader. In my picture story he also becomes the fairy tales king, the father that promise the prince half of the land and the hand of the princess. You will find Han Solo, who in my pictures has the role of being the prince or much more the “princess” of the traditional fairy tale. Like the princess is in the coffin waiting for the prince Han Solo is in his “coffin” waiting for his princess to save him. He is in the princess’s container where he waits for the only true love. I have chosen to depict the figure in many ages, both as a child with the teddy bear as comfort and companion, as warriors with weapons like swords, guns and bows, as well as a lover dancing and caring. Myths and fairy tales are themes that come back, so when you look through the pictures, you will see that I’m working on playing with several like: Eve in paradise, Sisyphus in Hades, The Frog Prince, Snow White and Wilhelm Tell, St. George and the Dragon and many other. When I looked through my project I see that my princess seems to be a searching. She is a wandering faceless figure in almost all the images. Through my images Leia has become a female Ahasuerus; constantly wandering in anticipation of salvation. Perhaps she will find her salvation in a frog, perhaps in a lover, a father or in death. I know very little about the Star Wars Princess Leia. In my imagination she is a lonely, brave strong woman who partially fills the days of exercising the role of coping with a never ending war. She is a warrior in the creation and through my images you can glimpse her journey. It may be the one you recognize from the Star Wars saga or not. I hope you see more than this because that is what I wanted to investigate with and through my camera. 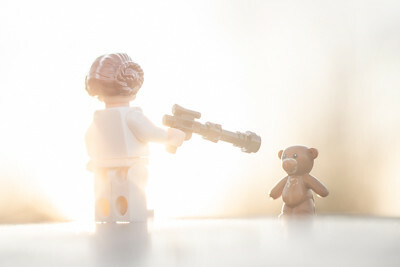 Through my images the toy becomes a figure that I see myself; Leia is I. But I also hope that she will be a figure that you will recognize yourself in. Maybe Leia can be you as well. You can look through the project above, or find all the pictures on flickr. What will come next? I’ll keep appearing on the Toy Photographers podcast where you can hear James and I talk about doing images on a theme once a month. I don’t think I’ll do another toy photographic project like this one. It’s too much work (pictures) to go through at once… For now I have a totally different method to do my photographic projects. I make them tighter and around a theme from the beginning. I limits my scope… much more controlled .. Maybe I’ll have the opportunity to share my thoughts around that method in a later post or in the podcast. Anyway I hope I’ll see you on the web. I have been both fascinated and moved by this series. There is so much emotion and symbolism in these images, it’s no wonder you had burned out by the end of 365. I am so glad that you found new lives for some of them. Thank you for sharing that Tony! When I started working with Leia it was with great distans, but she or the project in itself grow on me, so in the end I was lost in my own idea around this figure. I think they needed to be sorted, and selected, so many of them were close to the same, and yet not the same. I’m so glad to hear that my work was seen. Thank you! Such an inspiring blog post! It’s been a really long time I haven’t read something that boosted so much my motivation to keep working on my own images. I’ll probably never manage to focus so much on such a small number of characters for a whole year, but I connect with a lot of issues you encountered during the selection process. Growing up as a photographer, it takes me more and more time to select and curate my own photos. Sometimes I wait months before being able to make any choice between different photos telling a similar story. Your post is another great reminder that I really need to get a printer so I can spend more time around my own pictures in a physical form. 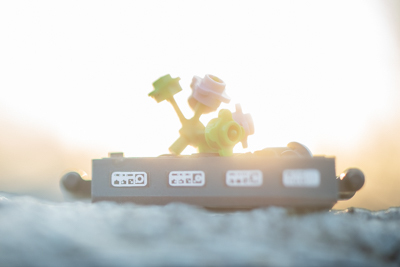 I’ve spent the past year taking photos of the same toys, without any specific goals except maybe letting myself be guided by intuition and inspiration. I don’t know yet when I’ll be done (maybe never?) or what we’ll be the outcome. But I know for sure that in the end, it will be a lot more about myself than about the characters supposedly represented in the toys I use. Thanks, I so happy that I can inspire you 🙂 I need constrains to get focus, but I get that we are different. I love that you are working on a project yourself, the curating part is hard, I believe that a photographer one need to practice to curate as well as we practice photography. To find lines and threads in our work is a different task – and I have tried to find those through this work. I encourage everybody to give it a try, to look through there photographs and curate them to a project or a bigger story. Printing have helped me a lot as well as time, letting the images be, resting and getting back to them with fresh eyes. Excellent write-up, my friend! I know we’ve talked about this series a lot on the podcast but it’s still so nice to read your thoughts on it. Congratulations on completing it! 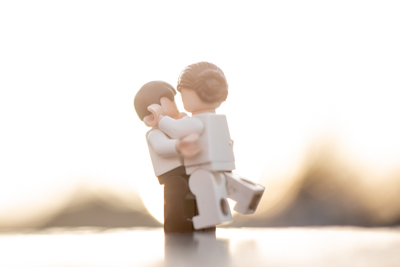 I’ve always been too intimidated to take on something like a 365 project, and can’t imagine how tough it must have been narrowing down all of your Leia shots. This was such a fantastic series, and one I appreciate more and more as I’ve gotten to know you. I call the project a big success! Really found your thoughts fascinating, Kristina! Lots of fresh thoughts about ways to approach this sort of project, and how to use the photos afterward. Sounds like you found a lot of value in it. It’s going on my list of things to try someday. Looking forward to browsing through the Flickr collection of your final 59.